Future Renaissance imagines a distant future society of intelligent machines that only dimly remember humanity. With digital records lost or corrupted, the machines study humanity’s surviving physical artworks, using this imagery to illustrate their own creation myths. Making the images for this fictional exploration of the distant future required unconventional techniques, which evolved into a complex collaboration between human and artificial intelligence image making, suggesting a new approach for image-making using machine learning and neural networks. 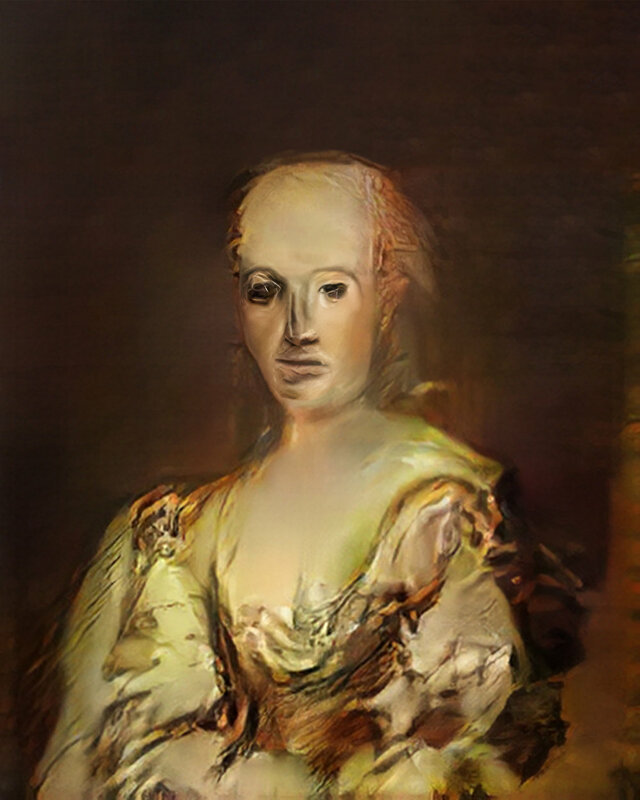 The process of collaborating with various neural networks in turn helped inform the speculative fictional storytelling about the future of artificial intelligence. The speed and limitless profusion of imagery produced by neural networks trained on tens of thousands of images is made slow and contemplative through compositing and delicate materials as the images depart the digital world and enter the physical world through laborious traditional and electromechanical image-making techniques. With a background in mechanical engineering, design, and entrepreneurship, Chris Luginbuhl combines design & problem solving expertise with a wide array of fabrication skills. Combining digital imaging and technical skills, Chris develops new techniques and technologies using design and fine arts to overcome the limitations of conventional approaches to problems. Chris has a long career based on imaging and Research & Design, and holds numerous patents. His business background includes photography/videography and mechanical design, and he was the co-founder of a successful Canadian medical device company.